There was a drought of good googliness there for a while, but the wackiness is back. 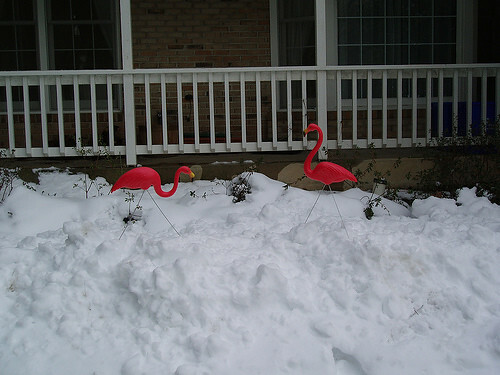 If you're interested in plumbing the depths of strange thought, unconventional capitalization, and downright weirdness that brings people to WoT, Volume 11 can be found here and leads to successive links backward to previous googly posts. challenges of being short - I can't really help you there. I'm a bit over 5' 7". once and now – Umm.... This search strikes me as completely useless in its boolean nonspecificity. It's like searching for "this and that" or "up and down." Go back. Try harder. macintosh babe - Every group of Google searches has some variation on a search that brings people to the babe magnet post. who sang secret asian man - Ummm... Johnny Winter? Jill looks like - ...hell, because it's seven-thirty and she hasn't had a shower? Seriously, on the day this came in, I was the #1 result for this search. Today... #4. Ah, the mysteries of Google. Hello dad I’m in jail and i like it the people are neat - Behold: the perils of quoting a Was/Not Was song on one’s blog. consciousness of trees - Duuuude. why is hamlet not king? - I’ve told you little so-and-sos before – do your own homework. It also appears he's not immune to the lure of the open forest out back. We have a small, fenced area behind the house (only those whose world-view is seriously tilted would call it a "yard" - it slopes at a 45-degree angle and resisted John's mighty efforts to seed it with grass). Occasionally, say when someone has had a stomach bug and would rather not throw a frisbee or walk long distances, we let Tosh out to run around and have a sniff and a pee back there. He usually amuses himself by barking at squirrels and trying to get the chipmunk who lives under the deck to come out and play. 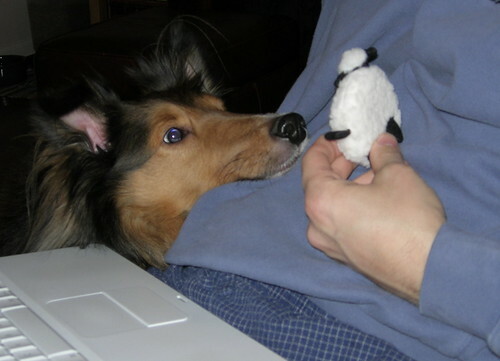 This activity generally doesn't keep his interest for too long, and we'll see his long nose and button eyes outside the slider again within about fifteen minutes. The other day, having had a long nap and being pretty bleary, I opened the back door for him. About a half-hour later, I realized that the dog was taking his sweet time about coming back up. I went out to the upper deck and called for him. Funny. Even though he doesn't usually come right away, I can almost always hear him rustling around in the dead leaves in the "yard." Feeling that nightmarish, sinking feeling I walked to the edge where I could see the gate. It was wide open. I scanned the woods. I called. I whistled. 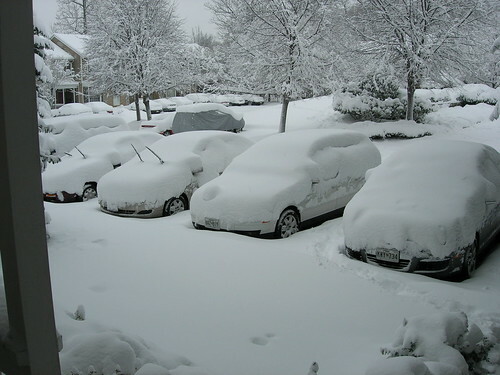 I spluttered expletives as I blasted back through the house, threw my boots on, and wondered where in hell I was going to start looking for him. 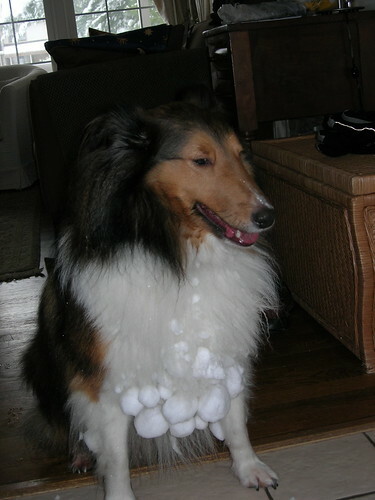 Thankfully, just as I was getting outside and scanning around, assessing my options, I heard a mighty rustle and Tosh blasted out from the side of the house, panting, eyes bright, happy as a doggy little clam. About that same time, our neighbor Kathie came home from work (she's the doggie godmother of all the canines in the neighborhood) and our mailman circled back to say he had seen my little wandering one barking around the neighborhood (lovely man). It was at this point that I stopped wondering why I was so calm and collapsed into tears, poor Tosh completely bewildered at why I would want to wrap my arms around his fuzzy little body and produce salty liquid. I think we can label that "nonplussed." 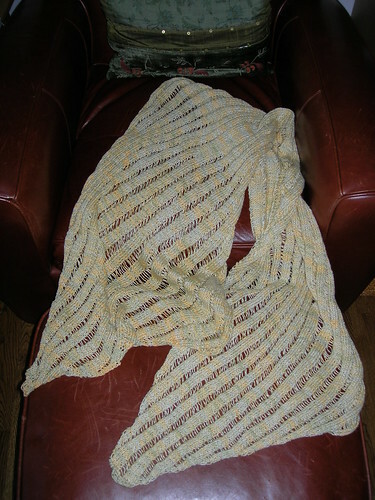 I made insane headway on the clapotis over the weekend, and I can now announce that it is actually finished. Here's how the Knitting Olympics** differs from the regular Olympics: stomach bugs can actually help you medal. We shall not speak of the actual stomach bug, but let us just say that today when I was not sleeping I was knitting on the couch (sorry, Marie. Like you said, I have no kids). ETA: Finished dimensions: 24" x 62", 3 balls (almost exactly) of 250 yards apiece Southwest Trading Company 100% bamboo yarn, color "Butter." *Look at it, reclining so casually on the chair there. "What?" it seems to say. "You were worried? Ehhh... we're done here. Let's go to New York and impress the locals." **Many thanks to Rana for helping me get my knitmojo back by challenging me to do this. 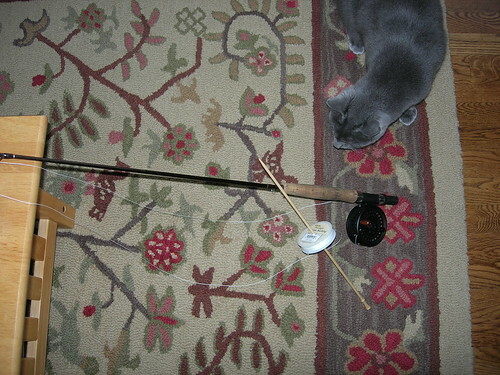 John has a new fly rod, and needed my assistance to wind on his line. It turns out that a Brittany #8 needle is a perfect axle for fishing line. One of them developed a hole, right in the arch, so it was an unfortunate yarn failure, rather than my bony heels or pointy bunions. I then did something monumentally stupid: thinking it would be a good idea to somehow knit a flap and graft it into the sock, I cut a big hole in the sole of the sock. Thus, they are my "My Lai Socks." I nearly had to destroy one in a misguided attempt to save it. (NB: If, after this post, I get Google hits for "My Lai Sock," I will be very, very frightened.) They have languished in my stash chest for lo these eight years or so now (I only wore them sparingly when they were still whole, preserving their wooly warmth for indoor use). I don't know how to darn, you see, and I refuse to let these socks go. Yarn spun by my friend, springy cables and thick wool encasing my ankles - these socks have to be in shreds before I will let them go. I love them beyond reason. 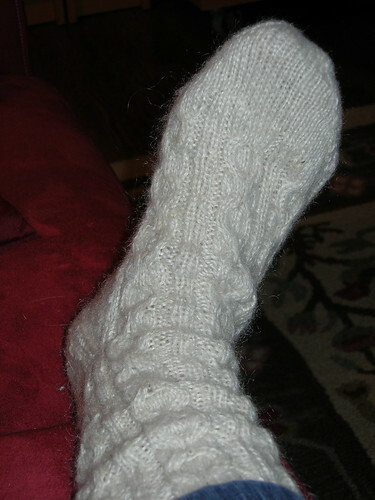 So, in a mad frenzy to spend my Valentine's gift certificate yesterday, I brought my sock. I had a half-formed plan: I would wave it in front of the lovely women at the LYS, and see if any knitting wisdom would emerge. 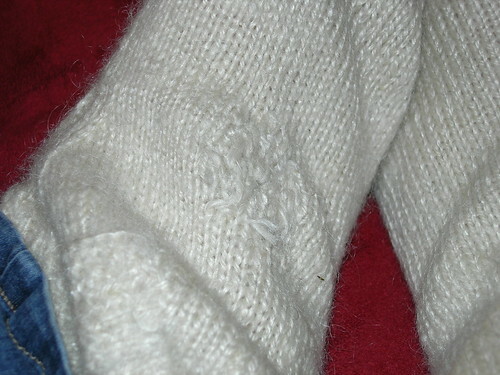 Perhaps a lesson in darning, or an advanced grafting lecture. It was touch and go for a few minutes. After all of the knitladies in the shop had a chance to look at the sock and shake their heads and cluck over its tattered state, one of them asked me, "Why don't you just throw it away?" "Because my friend spun the yarn." It's a bit rough and ready, but I can wear my My Lai socks yet again. 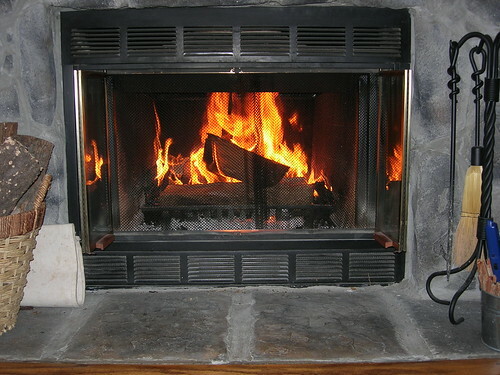 My feet are warm and I am happy. 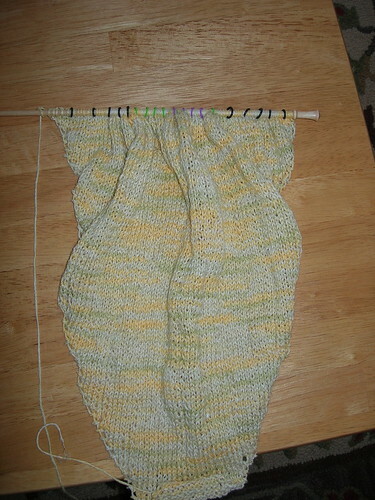 I have decided there are few things less interesting to photograph than a clapotis-in-progress. "One more dropped stitch ladder! YAY!" No. Not yay. It's a good enough Olympic project in its own way, as it has those dropped stitch ladders to use as intermediary goals, prods, and measures, but that's probably only interesting to the knitter. I am making decent progress and we shall leave it at that. Last night's professional association meeting and dinner was no help in the knitting progress department, though. In other news, I found out that the graphics designer at one of my former workplaces knits! His daughter learned, and wanted help with some of her projects, and in the way of all parents everywhere who relearn geometry for the sake of their progeny's education, he learned to knit. That's right, you heard me. He. Another guy who knits. I think men who knit are wicked. John does not knit, but that's okay. John asked me to teach him years ago, and our relationship was not enlivened by the experience. I console myself now that he appreciates the knitwear I crank out for him and his relationship to fiber (fly tying) is such that he can use all the little scraps I generate. I didn't have to sell my hair and John didn't pawn his watch, but we did get Hallmark-holiday things for one another that were very suited to our interests. 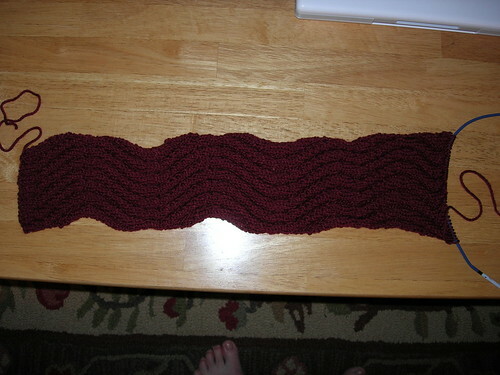 I got a new row counter and gift certificate to the cannot-be-plugged-enough Knit + Stitch = Bliss. John got a fisherman's lanyard. There will be seafood and knitwear in our house. What a surprise. On a completely unrelated note, there is an Olympic biathlete on the Norwegian team who rejoices in the name of Ole Einar Bjørndalen. I have decided that with that name and sport, he is possibly the most Norwegian person on the planet. The only way he could be more Norwegian is if he became the spokesperson for Lena Ingebretsen's House of Lutefisk. He's also got a brand-new website for his business. I think it's pretty neat, and what an honor to be couple #1 on Valentine's Day!. The old Johari window trick. ...So, yeah. 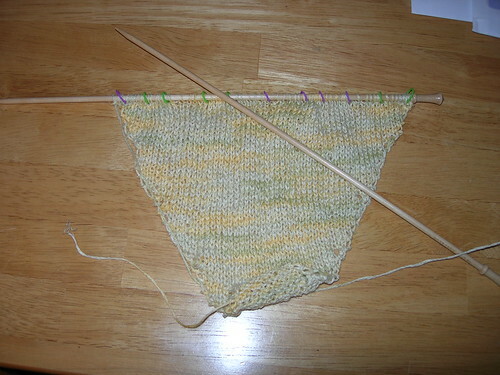 WoT should probably now be called KoT, because I don't seem to be writing much, just typing about knitting. I suppose that's what happens when you fill your brain with mostly two things: work and knitting. Can't write about the one, not too much to say about the other, but hey - nifty pictures! There is a terrible, transgressive thrill to knitting something and then, carefully and deliberately dropping a stitch and letting it ladder all the way down. (Yes, I need to get out more). It's something that you usually learn to avoid at all costs - seeing a stitch drop and then take its neighbor down with it: this is the stuff of knitting nightmare. This circumstance generally makes a knitter catch her breath and gently place the knitting down (usually laddering two more stitches in the process - laddering stitches are nothing if not promiscuous) and scrabble in her bag for a crochet hook to slowly and painstakingly re-loop the dropped stitches. Anyone in the room with a knitter who is going through this has probably learned a few new words and the knitter usually shaves off about a minute of life due to cessation of breathing and elevated heart rate. Also, if you're me, you get so focused on the dropped stitches that you're re-looping, you miss the fact that the tugging on the work has caused another stitch to take a leap off of the left-hand needle and start its horrifying descent into ladderville. So this piece is all about deliberately breaking the dropped-stitch taboo. See? Pretty flower with snow? Ignore the knitting content down below. 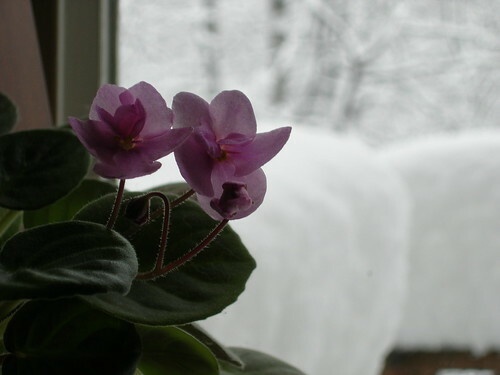 Nothing to see here except pretty pictures of flowers and snow. Well, no not really - but last night's fit of "I must get to a point of accomplishment before I go to bed" means I have completed the increases. 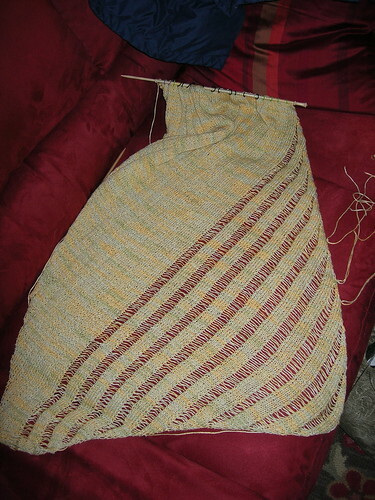 I'm making a wrap, rather than a scarf, so there are a few more increases than the original pattern. I am pretty sure that there are skaters out there who justify the purchase of new spandex and skates by their presence at the Olympics. Therefore, I feel no guilt (none - none at all, I tell you) in purchasing some new Brittany needles for my Olympic Moment (where's my soft-focus, heartwarming profile narrated by Bob Costas, I ask you?*). 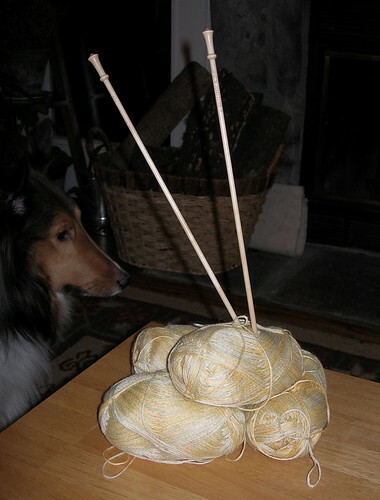 So here is my bamboo yarn and my new needles: podium-ready, don't you think? Best of luck to the entire membership of Team Clapotis and the rest of the Knitting Olympiad. May all your Olympic Dreams come true. *Note for the irony-deprived: KIDDING. Brittany needles may also be useful for stuffing in my ears when Katie Couric (TM) gets to be too much for me. You could say that I'm "In Training" for the Knitting Olympics. 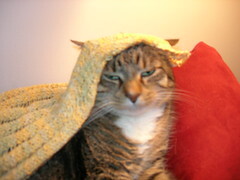 I have been doing all scarves, all the time lately, with time out for a hat for John's tender head. In other words, easy stuff. This from the woman who says she likes cables. Feh. You could also say that I'm brain dead and require small projects in order to get my knitting mojo back enough to actually cast on my clapotis. Yesterday I told Marie that my rationalization for doing all these no-brainers was to "really make sure I had my gauge completely even before I cast on another big project." She liked that one. Lyn called today from Knit + Stitch = Bliss and let me know that the other two balls of bamboo yarn she had found for me are ready and waiting. I think that was the final, "Oh my God" in my "Ohmygodohmygodohmygod I'm really going to knit on a deadline." I've been invited to join "Team Clapotis" for the Knitting Olympics. I may not be original, but it looks like I'll be in good company. 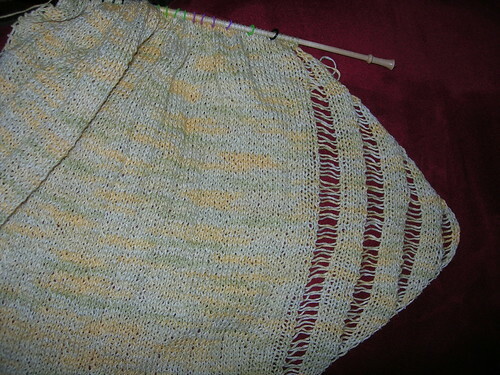 Yes, I am attempting a clapotis, with the bamboo yarn I bought recently. I shall cast on during the opening ceremonies and hopefully be finished by the closing ceremonies. Two Postings in a Row? You have GOT to be Kidding. Attention all Young People: learn good decision-making skills, lest you wind up like Our Heroine. As a young person, I was raised in the theory of, "Take your sniffles to school." This wasn't a popular theory for the Young Heroine, and I resisted it mightily. Often, the response to my resistance was, "Well, do you need to go to the doctor?" This seemed to my infant brain punitive rather than health-directed, so I did often gut it out and go to school with sore throats, colds, etc. By my last semester of college I was in full on "let's get this over with" mode, having had enough of my alma mater, my classmates, and my life as an undergraduate. Unluckily, this attitude coincided with my semester abroad in London. Even more unluckily, I ended up with what turned out to be a sinus infection. Per the script, I ignored it, not knowing the significance of feeling like my top teeth were falling out and barely being able to summon up the energy to get to where I needed to be. "Let the immune system deal with it," I thought. "That's what it's there for." As a result, ever since then my body pretty much lies down and lets sinus infections in. Nay - my body starts shaking cocktails and putting out cheese and crackers for the damn things. At least by now I have the good sense to call the doctor and get some antibiotics. After all, that's what they're there for.